2016 – June 5, Sunday 2PM Annual Strawberry Tea at Verdun School. Hughie Greene (age 94?) is the honored guest this year. Please leave a comment or question below. I would appreciate your feedback and will consider all suggestion to make this a more informative, useful website. Any and all information is much appreciated. 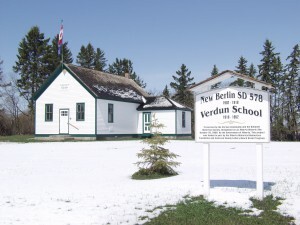 Sunday, June 5, 2016 was a beautiful day for the Annual Verdun School Strawberry Shortcake, Ice Cream & Tea (reunion) and approximately 60 people attended. Personally I met a number of old friends, community members, and some 1st cousins (once removed) that I share my Humbke Great Grandparents with. DUANE GEORGE son of William & Ila George, son of Joesph & Marie (Mary) George (Humbke), daughter of Ernest Dietrich Christian & Marie Louise Humbke (Schnepel). LORENE GEORGE son of James & Beth George, son of Joesph & Marie (Mary) George (Humbke), daughter of Ernest Dietrich Christian & Marie Louise Humbke (Schnepel). SANDRA GEORGE son of James & Beth George, son of Joesph & Marie (Mary) George (Humbke), daughter of Ernest Dietrich Christian & Marie Louise Humbke (Schnepel). ROGER HUMBKE son of Lawrence & Marvaline Humbke, son of Ernest Dietrich & Mary Humbke (Westenfeldt), son of Ernest Dietrich Christian & Marie Louise Humbke (Schnepel). SEE YOU NEXT YEAR ON JUNE 4, 2017 AT VERDUN SCHOOL!